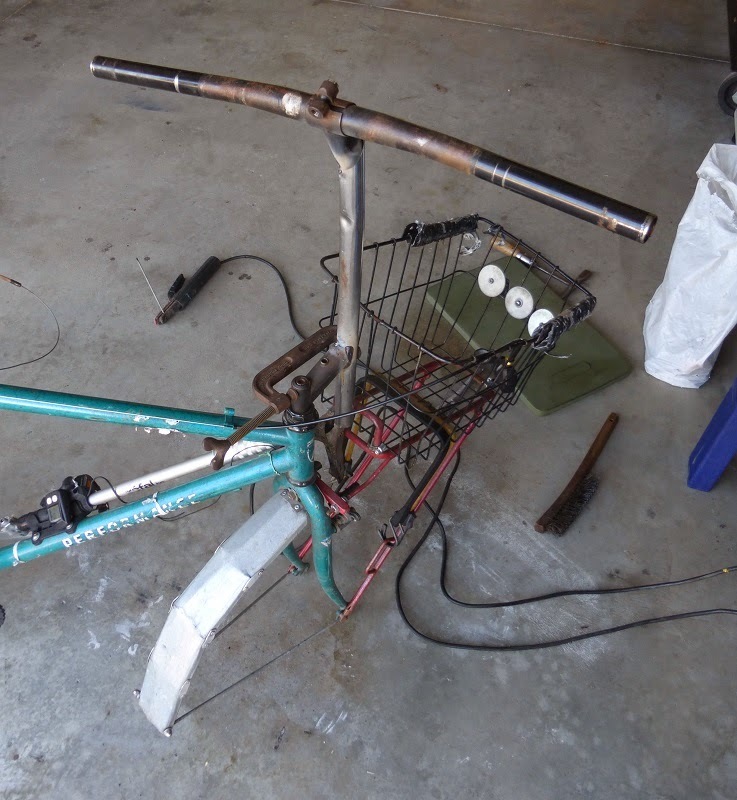 I had been using a stem riser to bring the handlebars up more. Riding before this was an absolute wrist destroyer. The stem riser helped for a good while, but it was a bit of a "Mickey Mouse" setup. 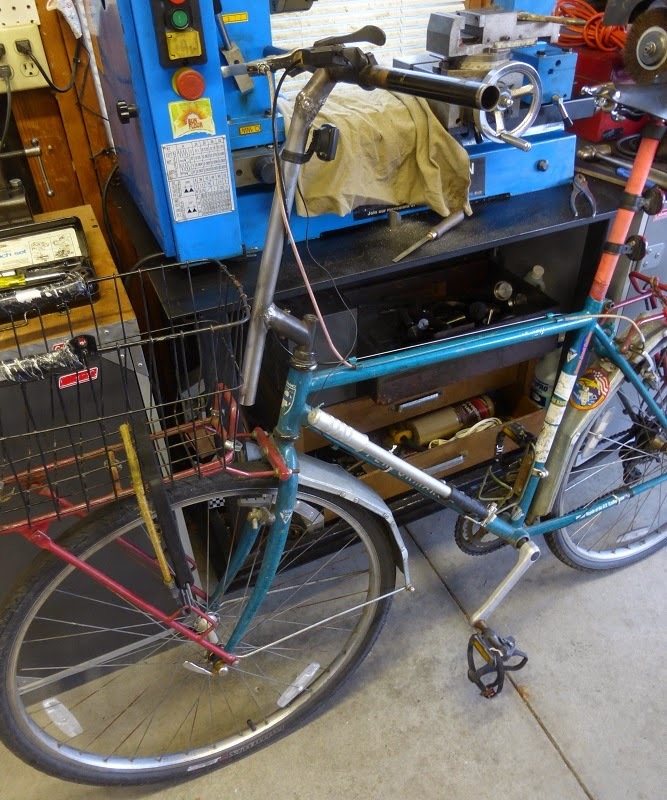 My main problems were that it still wasn't high enough, and when carrying heavy loads on the front rack (mostly the bike stereo), either the stem or the riser was susceptible to coming loose (this will be addressed later). 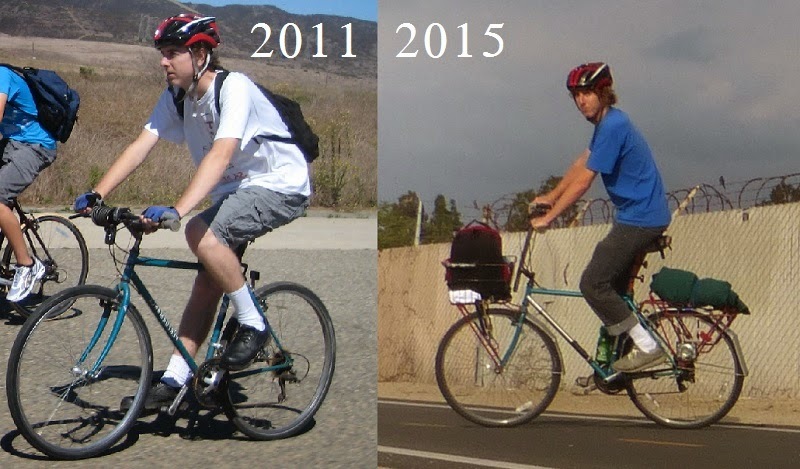 Also after so much use, the riser became noticeably bent forward indicating that I was still leaning on the handlebars too much which means they were too low. Disclaimer: I have no problem with the time trialists who prefer to have the handlebars a foot or two below jock level. They are choosing to be uncomfortable for the sake of going faster. Actually, I think that making it more painful would make you want to go faster, because then you could get done riding faster. That ain't my type of hype. Okay, time to make the quantum leap and butcher my stem. The spelt has been dealt, there's no turning back now. Another reason I liked the idea of using the original stem is that it has an integrated brake cable housing stop, which is utilized in the upgrade. 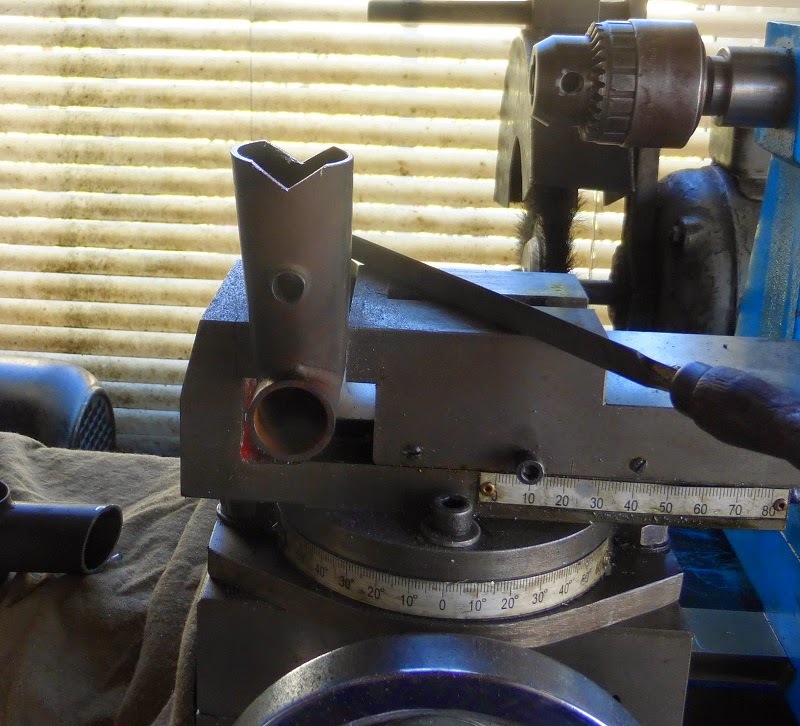 For the new tube to fit, I was originally going to use the milling machine with a 1" end mill to get a perfect notching. I decided that wouldn't be necessary, and went with the old fashioned method of filing. I started with a triangular file, and then used a half round one to match the tube's contour. 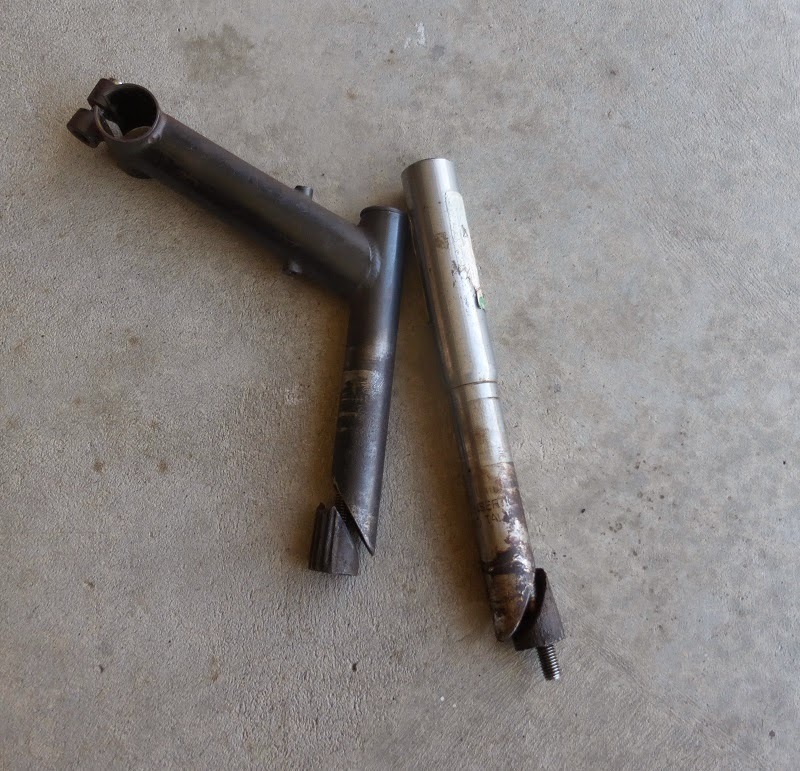 Prior to welding, I wanted to strip the paint off the stem pieces. This is usually a problem for me because my paint stripping abilities have historically been lacking. I went ahead and tried out an old rusty wire wheel I found since my other wire wheel never stripped paint any good. It worked like a charm. It seems that the other wire wheel was much softer. The rusty one was made in Germany, you know the Germans make good stuff. 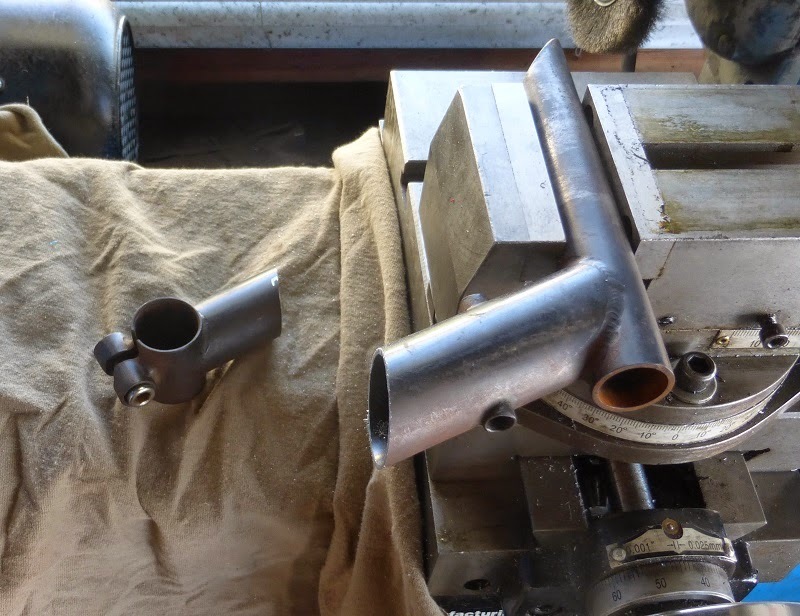 Now for the tack welding, I did it on the bike to ensure good alignment. 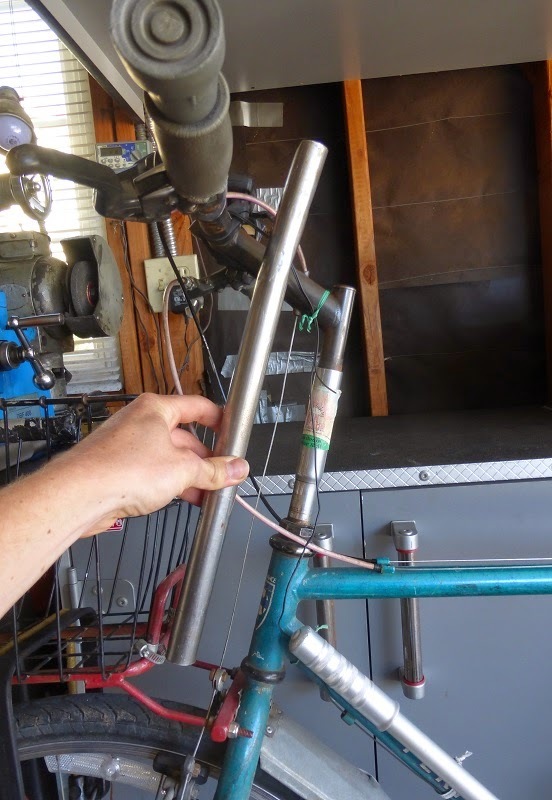 Once tacked, I took the stem out to get better welding positions. It wouldn't be one of my welds without several gapes to fill. Nothing I'm not prepared for. 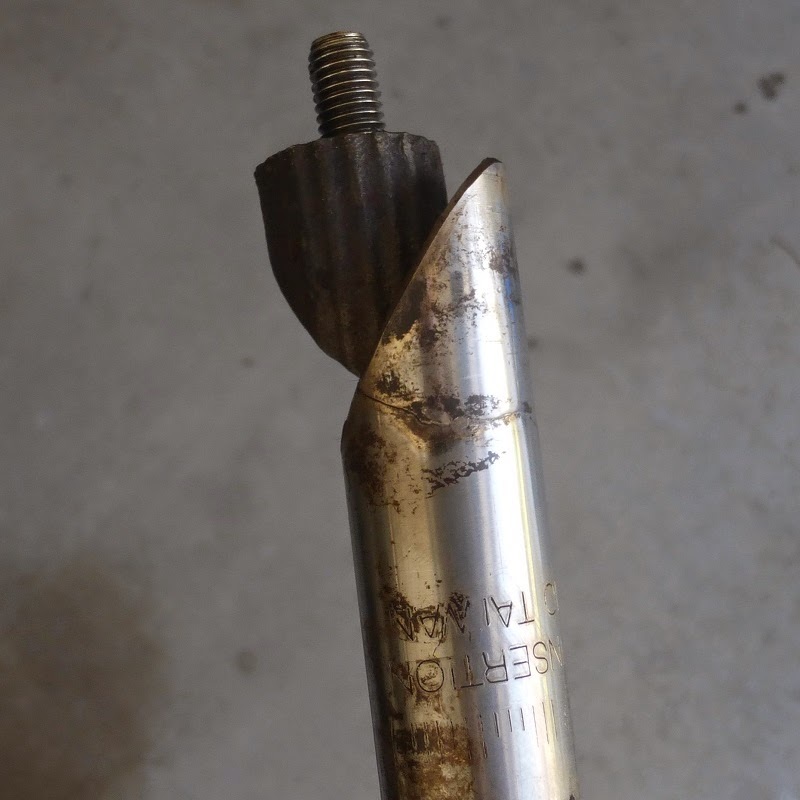 I think the stem said it was chromoly on it somewhere. 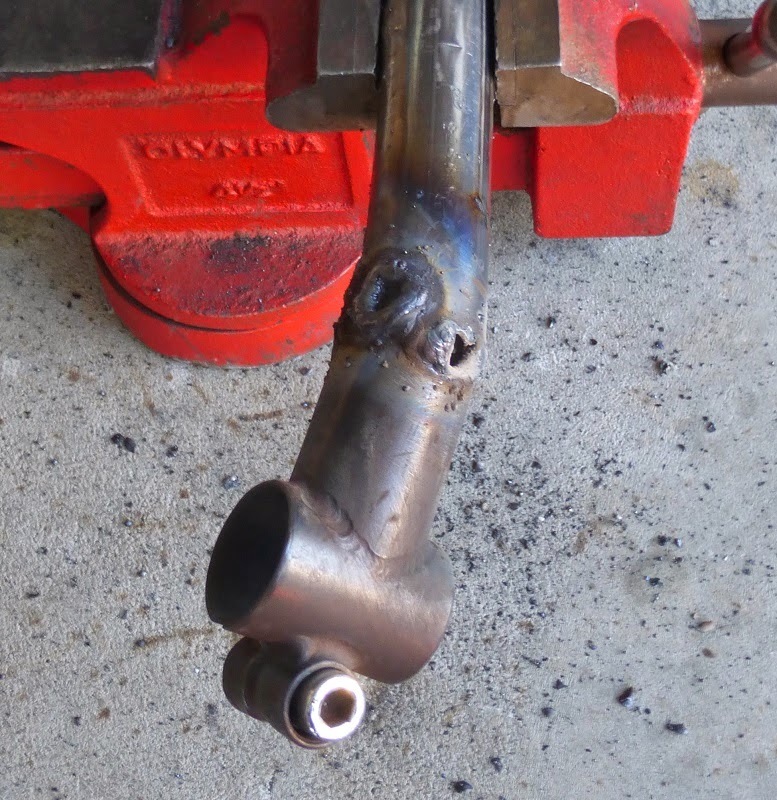 I don't know the etiquette for welding chromoly to regular steel. I did hear somewhere that it can crack if it gets too hot, but I don't care. If it breaks, I will be the first to know. How else am I going to learn? 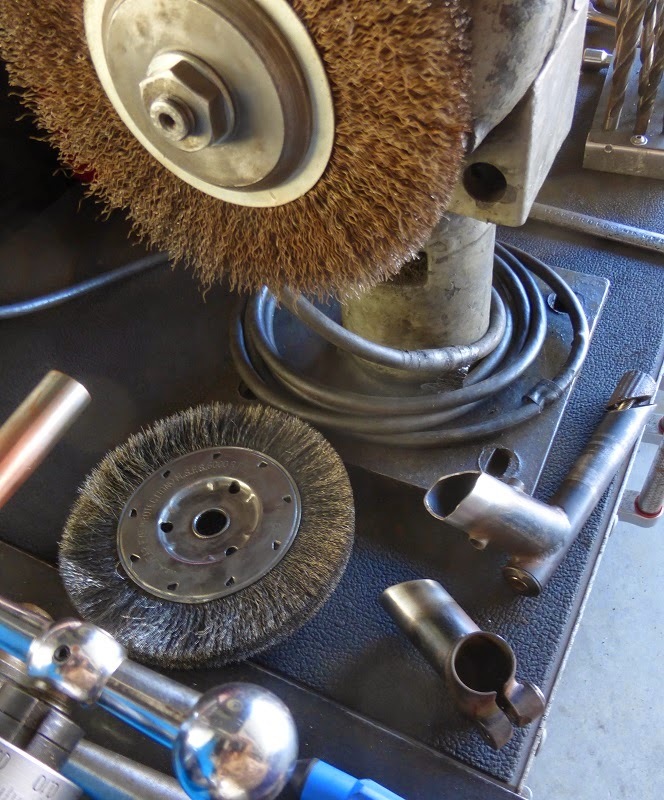 (See update below) The electrode used for welding was a 5/64" 6013. On AC. Oh yes, it worked. The problem now is now all my brake cables are all too short again! The portion of the tube that extends below the stem is for the anti-rotation mechanism which might be added later in part 2 (Which was later cut off since it was incompatible with the bike racks on the bus!). This modification greatly improves my riding position as now I can ride with my back upright, it just feels like sitting in a chair. Now imagine the irony when the next week I ran into a parade of lowrider bikes at the beach. Somebody commented that my bike was "too high"
After 9 months of abuse, the stem extension has cracked! Not really a surprise, I could feel that I exerted a lot of force on it when riding, especially up hill. This section of tubing would flex quite a bit in that area particularly. 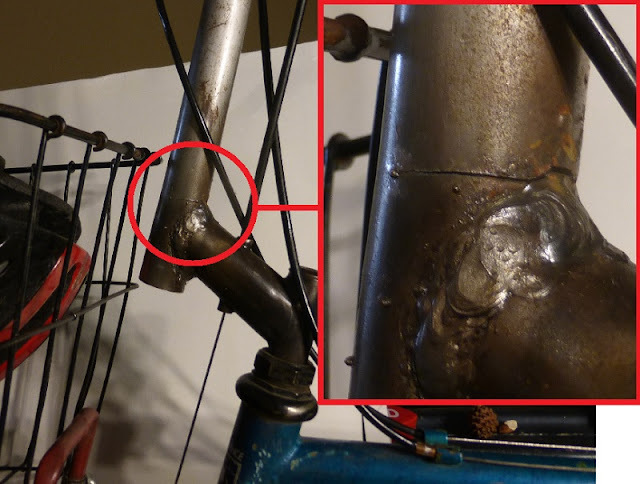 The area surrounding the weld is more susceptible to brittleness because of the presence of untempered martinsite in the steel (incidentally, I noticed the crack on the day of the final exam for the class which taught me that!) I'm just glad it became noticeable before completely breaking. This is why I used 2 pieces of tubing on bike upgrayedd 2. Check out the repair here! and the repair of the repair here! !